Phranakhon Rajabhat University was Thailand’s first teachers’ training school, founded by King Chulalongkorn (King Rama the Fifth) of the present Chakri Dynasty. It was officially opened on October 12, 1892, with the primary goal of producing teachers for primary schools. Eleven years later, the curriculum expanded in response to the demand for secondary school teachers. As the college flourished, it spread to many locations and underwent many name- changes. Finally, in 1956, the then Phranakhon Teachers’College was moved to the present location, on Changwattana Road, Bangkhen District, Bangkok. Not until 1974 was the degree program approved by the Ministry of Education, initially only in the field of education. A year later marked further major changes. Phranakhon Teachers’ College and five other teachers’ colleges in the Bangkok Metropolis agreed to cooperate in educational development and policy-planning and shared the common name of “Rattanakosin United College.” In the following year, Phranakhon underwent further expansion and offered associate degree as well as Bachelor’s degrees in arts and science, in addition to the existing Bachelor of Education degrees. The year 1992 marked the Centennial Anniversary for Phranakhon Teachers’ College. His Majesty King Bhumibol Adulyadej, the present King Rama the Tenth, graciously bestowed the name “Rajabhat,” meaning the “man of the King, servant of the motherland.” Therefore, from 12 October of that year on, Phranakhon was known as “Rajabhat Institute Phranakhon.” In addition, His Majesty granted permission to use his Royal Emblem as the symbol of the institute. 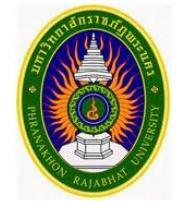 Phranakhon Rajabhat University is a local university focusing on creating ethical values along with bodies of knowledge and on enhancing technology development to achieve public recognition. Good day! I am Kenneth sevirine Bagangan, I am a teacher in the Philippines. I am actually searching for an opportunity in Thailand to study for masters degree full scholar. I am willing to render a service to teach English language in your institution. I am very much eager to study in Thailand. Rest assured that i would be willing to give my best performance to compensate your support with my studies.